Wait, what? I’m excited about being overweight? Sure, BMI is a total bunk, but it’s at least fairly reasonable for my body at the moment and at the very least it works as a nice landmark in my weight loss progress. 🙂 When I started weighing myself on the Wii Fit, I was at the top of the Obese scale. 40 pounds later, I’ve transitioned to Overweight and have a little further to go. 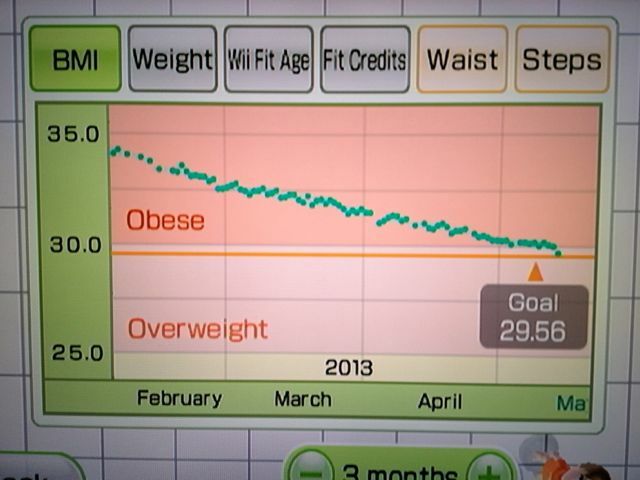 The “goal” line in the above image is just an intermediate goal because the Wii Fit only lets you set your goal weight loss at about 20 pounds lower than the current weight.